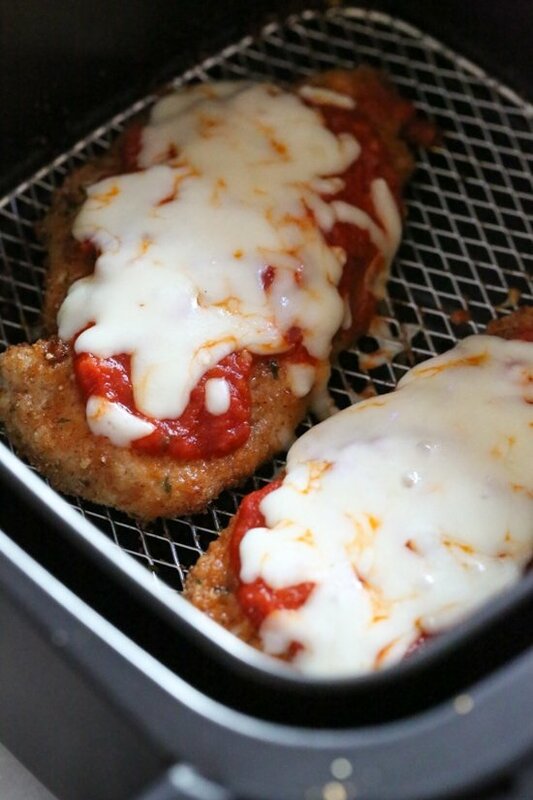 This easy Chicken Parmesan Air Fryer recipe comes out juicy and delicious. 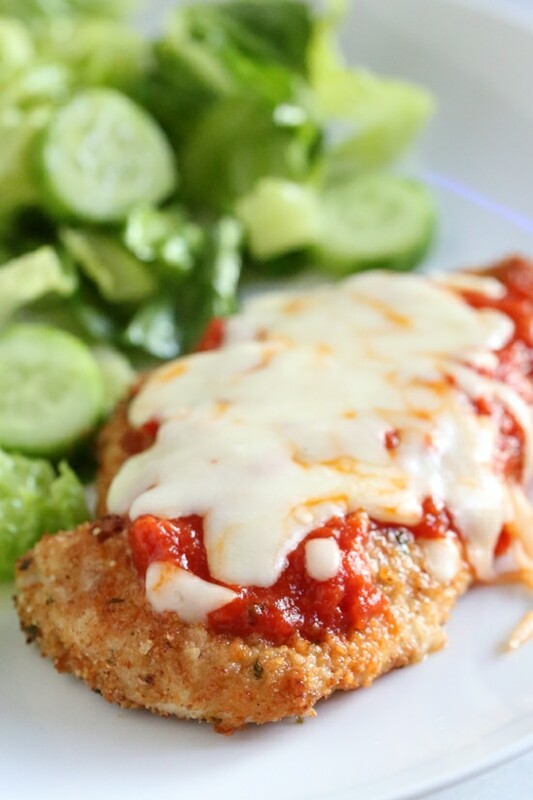 Ready in only 18 minutes this is one chicken dinner your family will love! I’ve been using my air fryer (affiliate link) all week and having fun! This past weekend we made Chicken Parmesan for dinner, and since it was only three of us eating, I used the air fryer. The results were great, no complaints from my husband so that means he approved! I basically followed the same recipe but made half, and added the sauce and cheese the last three minutes of cook time. I made them in my Skinnytaste Vremi Air Fryer that you can pre-order now, it comes out early May! The results came out best in the air fryer, but whichever way you make them, they will still taste great. 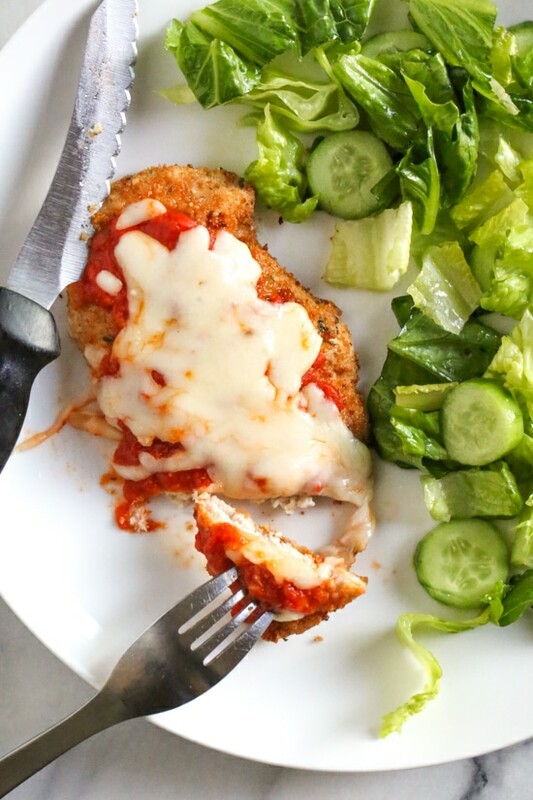 If you don’t have an air-fryer, you can follow my baked chicken parmesan recipe here. I brush the chicken with melted butter or oil instead of using egg before the breadcrumbs, they stick great and give it that “fried” taste without frying and tastes delish! To see some of my other air-fryer recipes, click here. Preheat the air fryer 360F° for 9 minutes. Spray the basked lightly with spray. Combine breadcrumbs and parmesan cheese in a bowl. Melt the butter in another bowl. When the air fryer is ready, place 2 pieces in the basket and spray the top with oil. 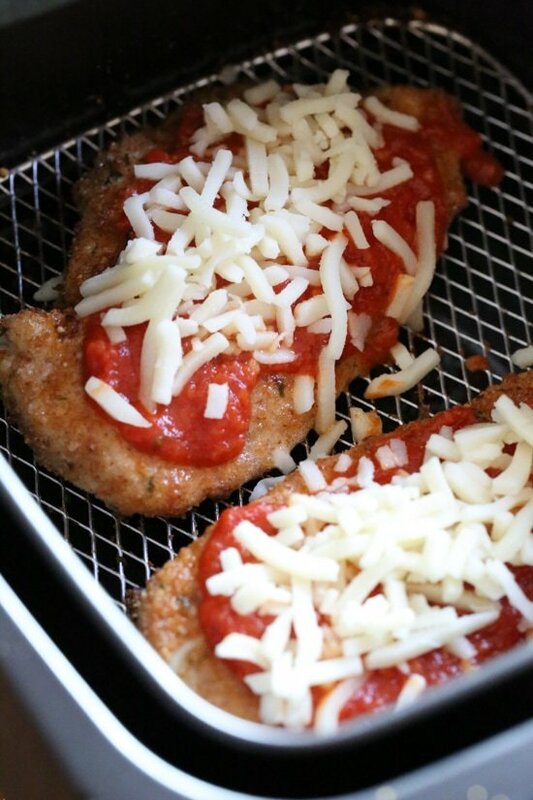 Cook 6 minutes, turn and top each with 1 tbsp sauce and 1 1/2 tbsp of shredded mozzarella cheese. Cook 3 more minutes or until cheese is melted. Set aside and keep warm, repeat with the remaining 2 pieces.